Before Hurricane Irene began its path down the East Coast shoreline I had been wearing Sally Hansen Strobe Light to match my pink pedi. But after it started to rain today, I made the decision to switch to Skyscraper from China Glaze to welcome in the crazy weather. 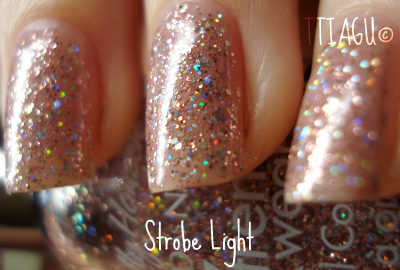 So while waiting for the electricity to go out, I have decided to review Sally Hansen Strobe Light. Good times! The Application: Sally Hansen Strobe Light went on smoothly though it was very thin even with the glitter. Unfortunately, the glitter didn’t go on evenly but if you shake the bottle really well first it ‘s more likely to disperse the glitter better creating a more even application. The Color: Sally Hansen Strobe Light is a light pink almost clear polish with pink, silver and light blue glitter. In the photos, I have two coats over one coat of Essie’s Sugar Daddy. Sally Hansen Strobe Light is very similar to Teenage Dream but not an exact dupe as Teenage Dream tends to be more pink with finer glitter. I used two coats on my nails in the photos, but you can see many gaps. I have a feeling it would take about three to four coats to become opaque. The Verdict: This would be a perfect layering polish as three to four coats seems like a lot of polish for one manicure. I can’t wait to try this on darker polish to see how if fares. As with most glitter, the removal takes some work. This one was no exception and took a lot of time and swearing under my breath. You think I’d be used to it by now. I don’t know if I am just sensitive, but I find the smell of Sally Hansen’s polishes to be extremely strong. I don’t know what it is about the formula but the scent bowls me over and tends to linger forever. Would I buy this again? I don’t know. It was pretty, but the strong scent concerns me and I can get similar glitter elsewhere with less of a pungent punch. Still, if you want a cheap alternative to Teenage Dream, this is a perfect polish. Pacific Blue was my second time venturing into the world of Sally Hansen Xtreme Wear line. What I like about the Sally Hansen Xtreme Wear line is the bold colors offered for a great price. I have been very lucky getting all of my recent Sally Hansen products on sale making each bottle around $2.25 a piece. Quite a deal, making my blue polish obsession grow! The Application: Pacific Blue was more pigmented than my first Sally Hansen Xtreme Wear pick Blizzard Blue which took five coats to become completely opaque. With Pacific Blue, it only took two coats. So much more practical. The thing I don’t care for with Sally Hansen Xtreme Wear is the brush. The size of the brush is larger like the OPI polish brush that I so adore, but the problem is the bristles are very plasticy and stiff. They barely give at all making it difficult to work with as the bristles don’t really move that well. Still for $2.99 a bottle at regular price, I can’t really complain. My other issue is the fumes of the polish. Maybe it was just my bottle, but the chemical smell was very strong which I found surprising as Sally Hansen has dropped the big 3 nail polish toxins from their polishes. A little disturbing. The Color: Are you kidding me? If you are a fan of blue like I am, you will love this color, it really is amazing! It’s what I would describe as a bright periwinkle blue. Two coats create a beautiful, perfect, opaque creme finish with plenty of shine. I guarantee you don’t have a blue quite like this one in your collection so pick up a bottle and enjoy the cool Pacific Blue. The Verdict: Amazing! Sally Hansen knocked it out of the ball park with the color on this one. It truly is a unique blue that you won’t find anywhere else. My only true issue with this nail polish is the fumes, it really is quite strong. Would I but it again? I am really tempted, but the smell does makes me curious as to what’s in there. My advice? When applying this polish, make sure you are in a well ventilated room. That way you can avoid headaches while rocking a great blue color!